Though growing Poinsettias can be challenging, it’s hard to argue they’re not worth the trouble: Poinsettias make up one of the most reliable niche markets in the industry. They are one of just a few greenhouse crops consistently sold in the final months of the year and account for the lion’s share of sales. One of the keys to succeeding in this market is to deliver a healthy, vigorous, disease-free crop to your customers. This is easier said than done; Poinsettias are susceptible to many different diseases and problems over the course of their long growing season. This article will help you learn to identify and respond to four diseases that tend to strike early in the production cycle: Erwinia, Xanthomonas, Scab, and Botrytis. A brief description of each disease follows, along with a chart to give you at-a-glance guidance in managing these diseases. Since many diseases present similar symptoms, it’s always important to obtain an accurate diagnosis from a laboratory. If one or more of the above diseases strikes, Phyton 27 and Phyton 35 can be used at the curative rates—along with the appropriate cultural controls—to help your crops win the battle. See the Grower Talks article listed below for one grower’s story on how he conquered a Xanthomonas infection. For best results, regularly rotate fungicides and bactericides to combat resistance. Phyton 27 and Phyton 35 are excellent resistance management/rotation partners and have a low risk of phytotoxicity when used as directed. Use the table below as a handy reference for identifying and managing these diseases. Plants wilt, yellow and collapse. Stems develop a mushy consistency. Cuttings turn brown and die. Wounded tissue susceptible, disease usually starts at the base of the cutting. Plants may have a fishy odor. Can be mistaken for Rhizoctonia; accurate diagnosis is important. Use a pasteurized, porous propagation media that drains well. Minimize leaf wetness. Keep misting to a minimum. Follow a strict sanitation protocol. Disinfect tools, knives, and benches with a commercial-grade disinfectant such as X3®. Employees should wash hands frequently. Aggressively remove any infected specimens or plant material at the first sign of disease. Test your water. Erwinia has been isolated in surface, underground, and irrigation water sources. Use Phyton 27® or Phyton 35® at the preventive or curative rates. Water-soaked, gray pinpoint spots, usually most severe on lower leaves. Spots turn yellow to tan and develop into an angular shape. Spots tend to be 1/8” wide with irregularly raised edges, often surrounded by a yellow halo. Can be confused with Scab; an accurate diagnosis is essential. Reduce leaf wetness, keep the crop dry between waterings. Minimize water splash—avoid overhead irrigation if possible. Avoid high humidity and provide adequate spacing between plants. Use fans to improve air circulation. Slightly raised, circular or elongated lesions on the stems and petioles. These lesions are tan in the center and often surrounded by white, red, or purple margins. Affected leaves may become distorted, and may yellow and drop. In advanced stages, the stems will grow very tall while the leaves will remain small. Minimize leaf wetness and water splash, avoid overhead irrigation if possible. Scout for plants with symptoms, especially unusually tall plants with small leaves. Pinching will help in detecting this symptom. If disease is found and you’re using overhead irrigation, start a fungicide program10 using Phyton 27 or Phyton 35 at labeled curative rates. Fuzzy gray sporulation. Brown spots on flowers, leaves, or stems. Remove all diseased plant material and use a protective fungicide, such as Phyton 27 or Phyton 35. Avoid overhead irrigation if possible. Improve air circulation. Use open mesh benching and adequate plant spacing. Lower Relative Humidity (RH). A few hours after sunset, exchange the air by turning up the heat and opening the vents for 5 to 10 minutes. This will carry moisture up and away from your plants and out of your greenhouse, while the incoming cool, moist air will heat up and have a lower RH. Follow a strict sanitation protocol. Disinfect tools, knives, and benches with X3. Employees should frequently wash hands. For more tips, please see our article, Seven Ways to Stop Botrytis. Brian E. Whipker, “Poinsettia Propagation: Erwinia and Rhizoctonia,” e-Gro Alert, Vol. 3, No. 48, August 2014, http://e-gro.org/pdf/348.pdf. J. Raymond Kessler, “Poinsettia Diseases and Their Control,” Auburn University, Alabama Cooperative Extension System. http://www.aces.edu/pubs/docs/A/ANR-1272/index2.tmpl. 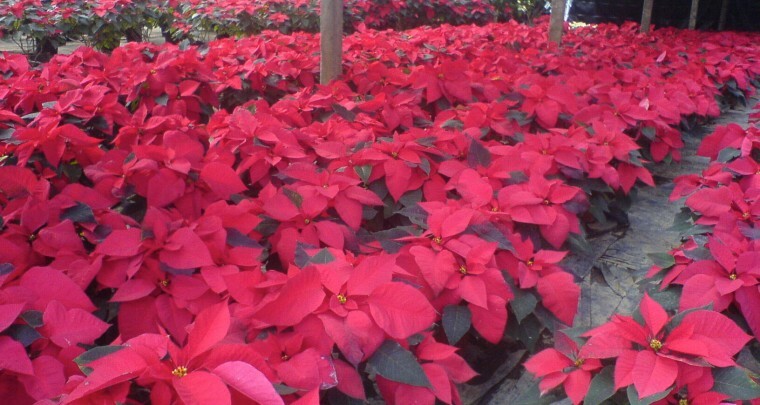 “Poinsettia Diseases,” University of Massachusetts Amherst, The College of Natural Sciences, Agriculture & Landscape Program, Greenhouse Crops and Floriculture Program, https://negreenhouseupdate.info/updates/poinsettia-diseases. Sign up for FREE access to THE EDGE and receive helpful articles & how-to’s delivered right to your inbox. Plus you’ll receive exclusive access to special offers & discounts.